Developer website: Future Apps Inc.
Is there a better alternative to iSpeak Translator? Is iSpeak Translator really the best app in Language category? Will iSpeak Translator work good on macOS 10.13.4? Future Apps proudly presents iSpeak Translator for the Mac, the most advanced multi-language translator available for your computer. Our iSpeak application is not just a mere text translator, but uses the highest quality text to speech syntheses available to speak the translated phrase back to you in the target language. Our text to speech is so powerful, it reproduces speech which is clear, and has a perfect accent in the target language. You will have a hard time telling the speech is coming from a computer! iSpeak Translator needs a review. Be the first to review this app and get the discussion started! iSpeak Translator needs a rating. Be the first to rate this app and get the discussion started! Our iSpeak apps have been the number one selling translation solution for the iPhone/iPad platform, and we are taking it a step further for the Mac. Instead of offering separate apps for individual language pairs, we are combining all languages into one application for an unbelievable price! 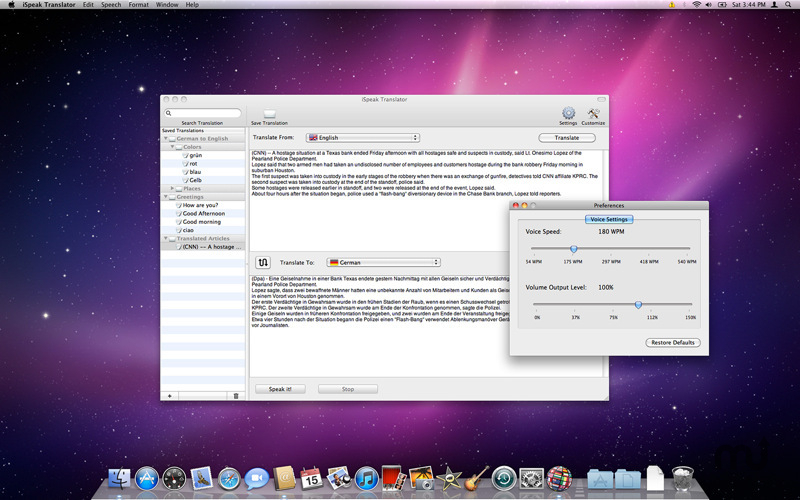 iSpeak Translator for the Mac includes five languages for the initial release: English, French, German, Italian, and Spanish. We will be updating with many more languages in the very near future at no additional cost. iSpeak Translator has been designed from the ground up to take advantage of all the Mac OS has to offer, and have also kept it incredibly easy to use. Simply type, paste, or drag any text from almost any document/application you wish to translate, press the translate button, and press the Speak it! button to hear you translation. Its that easy! Our advanced saved translation section allows you to quickly and easily save your translations and organize them in whatever way you like using groups. iSpeak Translator for the Mac is the perfect travel companion and language learning tool! Translates between any combination of the following languages: English, French, German, Italian, and Spanish. More coming soon!